This post is written by Dr Dav Smith, buildings archaeologist at the University of York. He gives details on how his work on surveying buildings fitted in with the rest of the CONCH project including the heritage team's work. Figure 1. Exploring the rich historic architecture of India Street, Pangani. Photo: Dav Smith (click to enlarge). My role within the CONCH project was to share my experience of buildings archaeology, a comparatively new area of the archaeological discipline, in which standing historic buildings are recorded, analysed, and interpreted to help us understand the past. For me, historic buildings are giant artefacts, and their construction, use, and change can tell us about how people in the past lived and what they valued. My visit to Tanzania started with a meeting and presentations at the University of Dar es Salaam (UDSM). It was great to meet colleagues and enthusiastic UG & PG students at UDSM and to hear more about the CONCH project. The following day we started the trek north to Pangani, where I was going to be working with some UDSM students, local Antiquity Inspectors, and UZIKWASA staff. Pangani is a fascinating town, with a rich and varied built heritage, providing exciting case studies, and we had a great team to work with. Over the following three days, we explored how to look at standing buildings archaeologically, and how to create accurate measured drawings of them, such as plans, elevations, and cross sections. 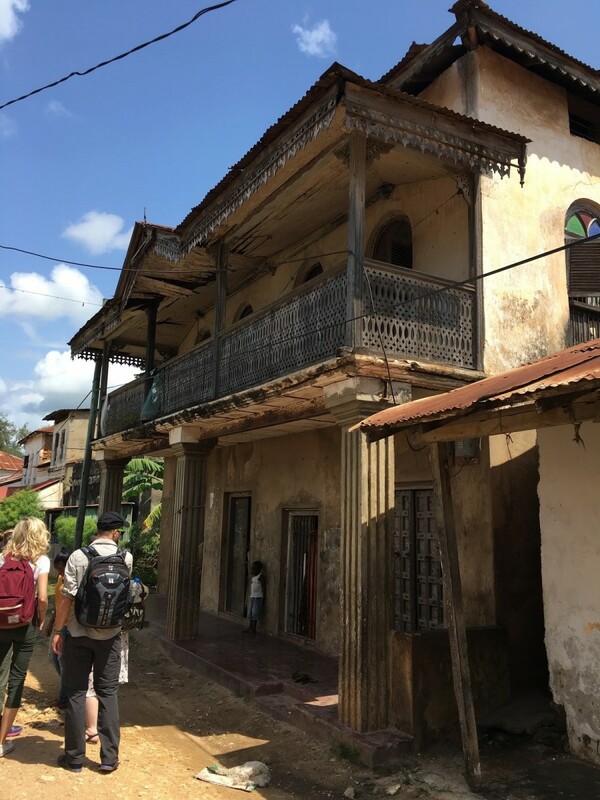 It was a fascinating opportunity to learn more about the region’s architecture, blending Swahili architectural traditions with those of India, Oman, Germany, and Britain, to create buildings that are entirely Tanzanian. Figure 2. Our photography session soon drew crowds of local children eager to appear on film. Photo Dav Smith (click to enlarge). Our final training exercise was my favourite - creating 3D models of standing buildings using photogrammetry software. Known as Structure from Motion, or SfM, the process involves taking multiple photographs from different locations and using computer software to create a 3D model. We decided that a traditional Swahili house would make a great site to experiment with this process, and Mr Bakari helped us find an appropriate house and gain permission from its owners. We started the photography session, and soon gained a following of local children eager to have their photo taken. Back at UZIKWASA’s offices we were able to use these photos to create a 3D model of the house and its setting, creating a permanent record of the structure as it stood in 2018. We were also able to create perspective-free images, which could allow traditional 2D drawings to be made. Figure 3. 3D model of a Swahili house using SfM software. Photo Dav Smith (click to enlarge). Figure 4. Perspective-free elevation of a Swahili house, ready to be drawn. Photo: Dav Smith (click to enlarge). My final experience of the CONCH project in 2018 was the recording of the Pangani FM heritage walkabout (see previous post). This was a brilliant bringing together of the different aspects of the week, considering the authorised heritage discourse, local knowledge of these buildings, and an archaeological perspective. Overall, it was a short but brilliant week exploring buildings archaeology in a completely new environment. I met so many passionate and enthusiastic people, who taught me as much as I had to share with them. Figure 5. Pangani FM - heritage on tour. Exploring the varied histories of Pangani’s built heritage. Photos: Dav Smith (click to enlarge). Figure 6. Pangani FM - heritage on tour. Exploring the varied histories of Pangani’s built heritage. Photos: Dav Smith (click to enlarge).